The majority of our courses are held at our training facility at Northampton. We have developed a superb training facility with conference rooms, training rooms equipped with the most modern training equipment, an exhibition centre and break-out areas. 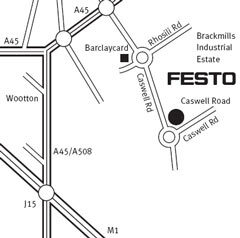 We are centrally located in Northampton just off the M1 motorway. There is plenty of free-parking at our offices. We are a short 15-minute taxi ride from Northampton train station. Trains run directly from London Euston and take approximately one hour. There are also direct services from Birmingham and many other major train stations. We have competitive rates with a number of local hotels and are able to the make the booking on your behalf. Please contact us if you require accommodation for your training course.